J.D. 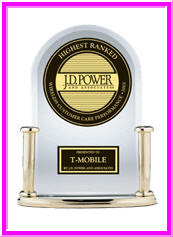 Power and Associates 2007 Wireless Customer Care Performance Study was released on Jan. 25th. customers who contact the carrier for service or assistance." providers, significantly above all of its competitors and the industry average. T-Mobile’s Automated Response System (voice-prompted assistance) ranks highest among all wireless providers, and significantly above the industry average. T-Mobile ranks significantly higher than the industry average in customers experiencing a hold time of two minutes or less. In direct dealings with Customer Service Representatives, T-Mobile is at or above the industry average in all nine variables and significantly above the industry average in seven variables, including Customer Service Representatives’ understanding questions. T-Mobile ranks highest among all wireless providers in the Walk-In retail segment of the study and is significantly above the industry average in four out of eight variables, including customers’ experiencing a wait time of four minutes or less.